Diemaking Supplies – Mallets – AmeriKen Online! 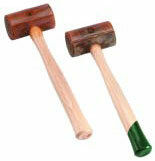 AmeriKen carries a variety of diemaking mallets and hammers. 0 1″ 2″ 2 oz. 1 1-1/4″ 2-1/2″ 4 oz. 2 1-1/2″ 3″ 6 oz. 3 1-3/4″ 3-3/8″ 9 oz. 4 2″ 3-1/2″ 11 oz. 5 2-3/4″ 4-1/4″ 22 oz. 6 2-3/4″ 4-3/4″ 24 oz. 7 1-1/4″ 2-1/2″ 8 oz. 8 1-1/2″ 3″ 12 oz. 9 1-3/4″ 3-3/8″ 16 oz. 10 2″ 3-1/2″ 20 oz. 11 2-3/4″ 4-1/4″ 40 oz. Reversible head provides a fresh striking surface, more even wear, and twice the life of other mallets. Outstanding dead blow characteristic minimizes spring back. Elastomer minimizes flaking onto dies. Cast without air bubbles to insure longer life and great strength. Replaceable heads also available. #2 1-1/2″ 3″ 6 oz. #4 2″ 3-1/2″ 11 oz. #4L 2″ 5″ 14 oz. #5 2-3/4″ 4-1/4″ 22 oz. #6 2-3/4″ 4-3/4″ 24 oz. Produced from cast aluminum and impact coated with a non-slip grip, this hammer frame is balanced to do the work for you. The dead blow connecting stud gives added weight and eliminates bounce. The precision steel rule diemaker’s hammer is also the only hammer with three individual heads – the main head is 1-1/4″ x 1-1/4″ and gives you plenty of knuckle clearance; the tapered rear head is 3/4″ x 1-1/4″ and is designed for inserting small knives and punches; and the unique bottom head is 1″ x 1-1/4″ and is best used for rule setting. All three are made of space-aged cast urethane and are easily replaced.